This was the annual NetDocuments partner and user conference, otherwise known as ndElevate 2018. I enjoyed the privilege of attending a couple of days at both conferences (which were held back-to-back) at the invitation of NetDocuments who funded my travel and lodging. For the users, NetDocuments revealed improved security measures, third-party integrations, and interface enhancements. For the partners, there were multiple panels on how to effectively market, train, and consult with the growing numbers of firms and organizations that are turning to NetDocuments for all their document, email, and file management needs. While every panel and session was well-planned and wholly informational, the highlight of the multi-day event was CTO Alvin Tedjamulia’s keynote presentation to a packed room. If you’ve ever had the pleasure of experiencing one of Tedjamulia’s presentations, you know it will be impassioned, oddly encouraging, and sprinkled with a touch of the eccentric. Building around a theme of fire with a flickering PowerPoint and the room’s fireplaces roaring, Tedjamulia likened the fundamental human discovery of fire to the great steps forward being taken in the world of document and file management with the cloud and the achievements of NetDocuments. Tedjamulia described the cloud-focused dream that he and the Duncan family had for NetDocuments 19 years ago when they started the company, and declared that NetDocuments was not just “cloud-first” but “cloud-only” in stark contrast to some of their competitors who continue to support some of their legacy on-premises systems. As Tedjamulia described it in his unique style, “we only have one puppy to love, while they have to love 3,000 puppies for multiple customers.” In other words, NetDocuments focuses on one single cloud platform that everyone benefits from when it gets improved and upgraded – everyone immediately “inherits” all of the user refinements and security advancements. To further support his talking points, Tedjamulia cited that 65% of customers joining NetDocuments are coming from other major competing platforms, while 31% come from the “manual” document management approach of simply storing files on a shared network drive. In 2018, NetDocuments on-boarded 238 new customer firms and legal departments at an average of 500 new users per week. The largest law firms using NetDocuments see an average of a 90% adoption rate which is spectacular given that a 100% adoption rate is near impossible for any organization. 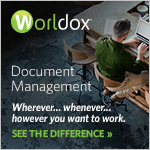 But why limit yourself to managing documents? 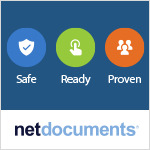 The team at NetDocuments believes their technology can and will support much more. For example, as more firms move to Office 365, NetDocuments has successfully and deeply integrated themselves into that infrastructure through the tapestry of Microsoft Azure. That’s happened at the base layer while a wide variety of services are supported in the middle layer that all prop up the user experience at the top layer. But those services are no longer limited to NetDocuments – there were several announcements during the conference explaining how other cloud-based services were fusing into the NetDocuments layers such as Diligen (contract management), DocsCorp, Workshare, and others. In addition, NetDocuments is available in the Microsoft Flow framework which allows apps to initiate an API call into NetDocuments. And while NetDocuments is typically viewed as technology for managing documents, email, and user collaboration, Tedjamulia proclaimed that they are more interested in establishing themselves as a “global cloud computing platform” which welcomes third parties and even competitors to hook into the cloud-based edifice they’re building. On the backend, NetDocuments allows individual documents to be double-encrypted in addition to a Matter Workspace Key, and all of this falls under the FIPS 140-2 Level 3 requirements. And while many companies discuss encryption at rest and encryption in transit, Tedjamulia pointed out that no one talks about encrypting documents while they’re “in use” which is an additional layer provided by NetDocuments. For the front-end security measures, Tedjamulia zeroed in on what he terms “Matter-Based DLP.” NetDocuments has obviously supported multi-factor authentication for quite some time, but that won’t protect a document if a user is already inside the system, since humans are sometimes malicious, careless, or naïve. Ethical walls can be created inside NetDocuments for restricting general access to matters (what Tedjamulia termed “border protection”) but Matter-Based DLP allows much more granular settings for what actions are allowed by individuals – can they search or download or attach files to emails? And because documents are locked down, encrypted, and encapsulated when stored in the NetDocuments Cloud Platform, there is built-in protection from the dreadful scourge of ransomware which typically happens when a user carelessly opens an email attachment that infects the files at a firm and renders them completely useless. This is effectively protecting the end-user from themselves. And then in a moment that could have been ripped from a conversation on the bridge of the Starship Enterprise, Tedjamulia briefly described their work involving the mechanics of quantum tunneling to underscore their commitment to staying ahead of security best practices even at a sub-atomic level. Another theme throughout both conferences was the “Power of One” which NetDocuments touts as a “complete cloud-based infrastructure that is wholly hosted and provided by NetDocuments,” meaning you’re no longer required to commit precious resources to constant database indexing and server maintenance. Even then, NetDocuments recognized that some customers required options for their geographically spatial locations, and realized that another avenue of the Power of One was for the end-users, and that’s where the ndFlexStore can help. For example, if you have a user in an office located in a different country, they may need to first stop and think about which server they needed to connect to before accessing a document. That’s wasted time and effort when NetDocuments offers a one-stop location, or firms can customize the service for their compliance purposes. A firm may opt to have certain documents or selected Matter Workspaces be co-located on-premises at a firm or facility, behind their own firewall. This provides the most flexibility for customers that fall under compliance or data protection regulations. In addition, Tedjamulia laid down the gauntlet of “uptime transparency” amongst cloud-based service providers, and reiterated the websites where NetDocuments posts their service status-pages in realtime. Not every cloud provider is open to doing this but NetDocuments believes it boosts their reputation by being open. While attendees enjoyed a s’mores buffet and delicious cheese being melted at a fireplace, there was a distinct sense of excitement and interaction among the crowd that seemed to believe they were working within the framework of the future of document and file management. NetDocuments firmly believes they are finally realizing the dream they concocted almost two decades ago, and that the time has come to spread like wildfire.